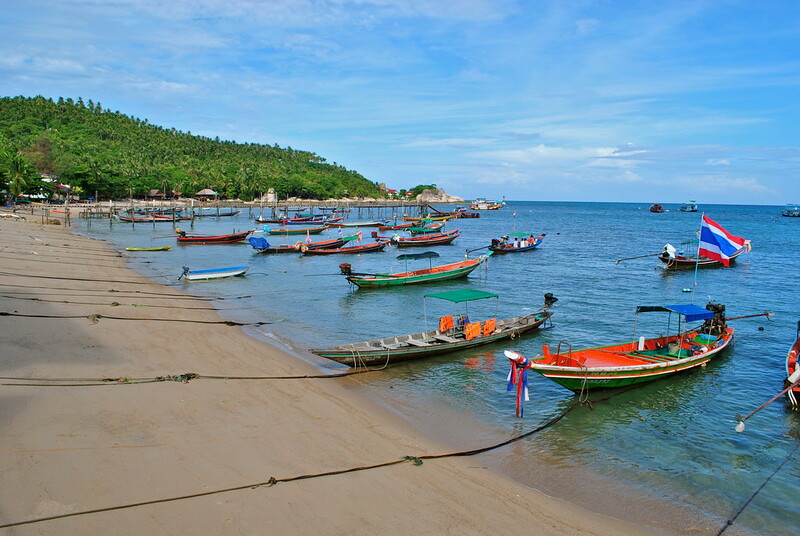 Small enough to get around and get to know, but big enough to have plenty of things to do, Koh Tao is a fantastic island escape if you’re in Thailand. We took the bus and ferry option to get from Bangkok to Koh Tao, and when we arrived we found Koh Tao to be a little rough around the edges, which we absolutely loved. We decided to stay close to the main beach (Sairee beach) where restaurants, bars, wooden shacks and dive schools share the coastline with palm trees and assorted exotic plants. 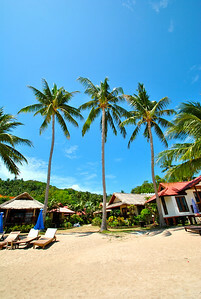 No boulevards along the beach here, simply wooden restaurants and bars spilling out of the palm trees onto white sands. Sairee beach is the busiest it gets on Koh Tao (which isn’t very busy) but you can get away from it all by going to one of the coves on any side of the island. We didn’t want to be completely cut off or at the behest of a resort and its pricing, we also didn’t want to stay in the heart of the action, so booked with the Amanjirah resort about 15 minutes walk from the beach. Koh Tao appealed to us because we hate the noisy, western style party places of other Thai islands (we’re still young, but not that young). That’s not to say there aren’t bars like that on Koh Tao, there are a few which are busy with young westerners getting smashed, but they’re all concentrated in an easily avoidable area a couple of blocks back from the beach. How old do we sound? 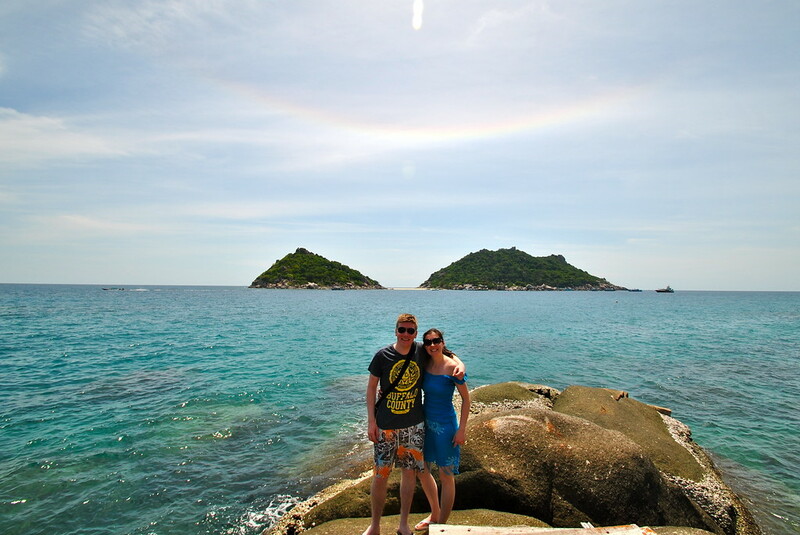 We were spoilt for choice of coves and beaches to visit on Koh Tao. We visited Freedom beach on the south coast of the island, spending a morning walking in the shallow turquoise waters and marvelling at just how quiet it was. We must have seen about 10 people that morning on the beach, June is a good time to go if you like it quiet! We also visited Ao Leuk bay on the east coast which was much smaller but equally beautiful, and the north west coast of the island looking out at Nagyuan island. After a hard day of looking at beautiful beaches and coves, we sat on Sairee beach and had a well deserved beer before sunset! It’s hard to come to Koh Tao and not do what its famous for, diving! So we took the plunge (quite literally) and booked a one day diving experience with Scuba Junction. You’re spoilt for choice on Koh Tao for diving schools, and the prices for the courses are pretty much standard so pick the school you feel most comfortable with. We went with Scuba Junction as we’d met one of the instructors in Bangkok, and liked the fact that for our first dive we would be in a small group of four people with one instructor. For anyone interested in a one day taster, we started around 0930 with an introduction to the equipment and how to communicate under water until about 1100. We then had a break for lunch until 1200, when we got wet suited up and headed out on the boat to our dive site! There were three other groups on the boat with us that day, so the bike was loaded up with the gear for everyone and off we went. Nothing is impossible on Koh Tao. It all went swimmingly well, except for when we seemingly entered the neighbourhood of a rogue blue and yellow fish who took a particular liking to my ear! Once it realised there was nothing of interest in there, it left us to enjoy the calmness and serenity of the corals of Koh Tao. As usual, after a hard day of adventuring, we kicked back on the beach and watched the sunset, reflecting on our incredible diving experience. 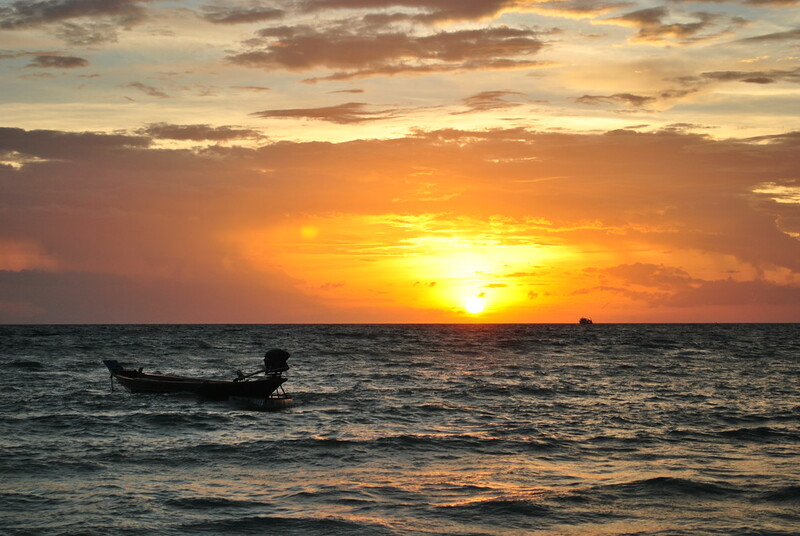 Koh Tao is an incredible place to stay. Seemingly on the tipping point of development, it remains quirky and interesting without the over development and commercialisation of neighbouring islands. You can go there and dive, of course, but if you want to relax and discover small coves of pristine white sands and turquoise waters, this is the place for it. It was a great springboard for our round the world trip, recharging our batteries ready for the beginning of our adventure! Want to know how to get from Bangkok to Koh Phangan? Or from Bangkok to Koh Samui? Check out our other articles! Or for more Thailand inspiration, click here. Sounds gorgeous, I’m loving the blog. Also, the upside down rainbow in that photo 5th from the top – magic! 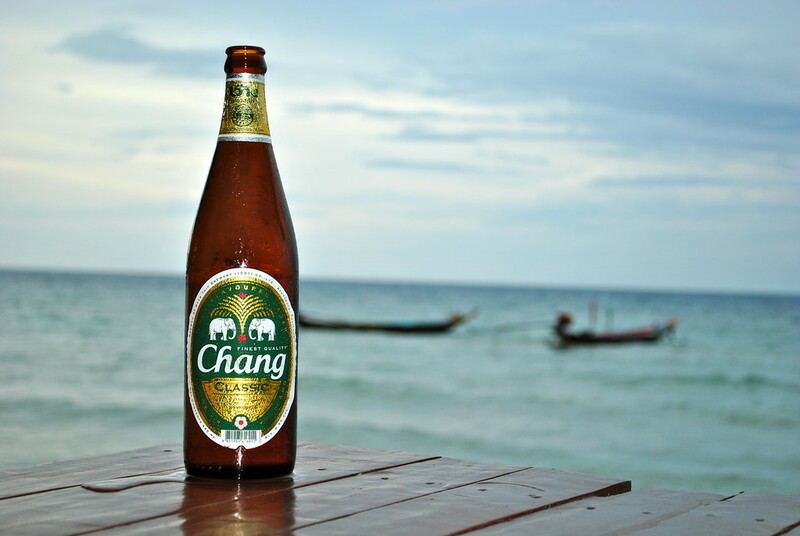 Great post – we’ve been living in Chiang Mai for the last 9 months now and love it, haven’t made it down to the south yet – but Koh Tao is one of the islands we most want to visit…hopefully get there in a few months! Cant wait! Only question is, is it to best to travel by train or bus? We only have 2weeks there!! 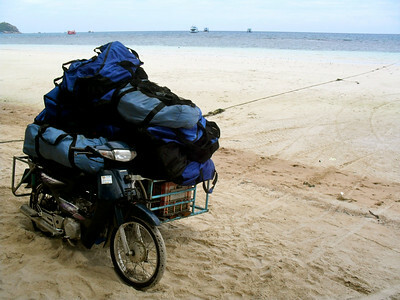 Hi Jenny, we looked into this a lot when we visited Koh Tao, and for us the bus worked great. 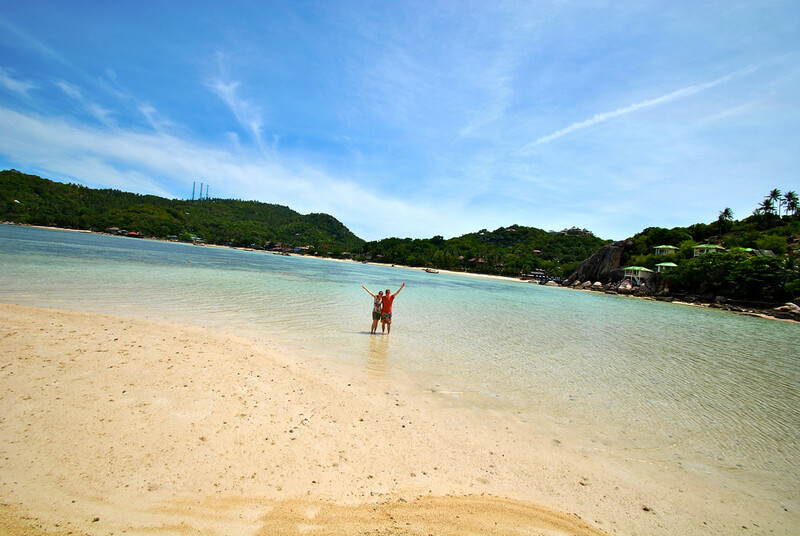 Depends whether you can sleep on a bus, but you do get into Koh Tao the morning after you leave Bangkok which is great! So you don’t really lose any time with the bus and I think the ferry is included in the price as well. Are you going diving there? Thanks for the info. on Ko Tao and on the Lomprayah bus company. The bus/boat combo is rather simple although the logistics were a bit confusing since nothing is explained. If you follow everyone else, you will get there with no issue. 😉 Our bus seats did spontaneously break on the trip back, squishing the unhappy Germans behind us. Unfortunately we had to sit with no backrest for a few hours since the bus was full. This was the worst part of the trip, but the rest went rather smoothly. They thankfully did NOT play any movies on the overnight bus! As far as Ko Tao, if you are planning to do a lot of diving, it seems best to stay with one of the diving schools. They offer discounted lodging while you are doing dives. We were not so interested in diving, so we found a place called Chintakiri on the Chalok beach. It was close enough to everything we needed and in a quiet, beautiful location. I do not suggest waiting to find accommodation at the last minute. We had trouble finding a place within our price range the week before. Many places also provide free taxi service to and from the hotel, which is very helpful since the taxis on Ko Tao are ridiculously expensive! Thanks for all your info. regarding Ko Tao! Hi Sarah, thanks for the info on the journey – glad it worked out ok for you! And great to know they didn’t play any movies on the night bus, maybe they’ve taken the feedback on board! Totally agree on staying at the dive schools, we wish we had stayed with one once we had got there – they are perfectly located for Sairee beach and the diving is brilliant! And as for the taxis, we couldn’t believe how expensive they were either! The snorkelling sounds great as well, thanks for the tips and report Sarah! Great reading Barry. Planning a trip for next year with my wife. Great to hear Mark, it’s a great island to spend some time on! Are you going diving as well? Nice reading Barry, we are planning trip to Thailand in April, one of our destinations will be Ko Tao. Do you recommend to buy bus/boat tickets online? or is it okay to buy them in the Lomprayah office right in Bankgok? 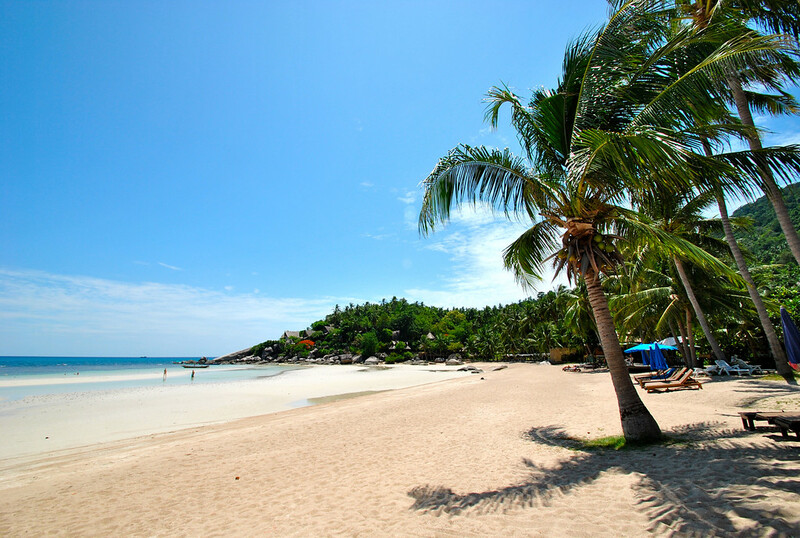 Did you visit other island like Ko Phangan, or Ko Samui? Hi Martina! I guess it depends on when you arrive in Bangkok and when you want to head to Koh Tao. If you’re planning on spending a few days in Bangkok first, you could always go to the office and get them when you arrive. If you’re arriving into Bangkok and heading to Koh Tao the same day, then you might want to book in advance to guarantee a seat on the bus, but then if you’re flight is delayed you might end up missing the bus! So I guess our advice would be, if you’re the sort of person who likes to be organised and booked in, do it in advance! If you don’t mind taking it day by day and just turning up, then you can do that as well! And to answer your other question, no we didn’t visit any other islands! Love your blog, informative and funny. Thanks. Wonderful Blog and very useful. Me and my wife would be visiting next month and had few queires. Will be great if you can help. 1. Any inputs on forest trails/walk present on the island? 2. How safe is it to rent a bike and ride on the island since the taxis are very expensive? Thanks for your comment! To answer your questions, we didn’t do any walks or trails on the island, so I’m not sure what options are available sorry! In terms of renting a bike, its pretty easy to rent one but you must check the quality and safety of the bikes/scooters you hire. We personally don’t like hiring bikes and scooters, but others do and if you want to, there are options on the island near Sairee beach.